Scrapbook Fibers and Ribbons entered the Scrapbooking arena in about 2000. I thought it was a little odd, but I soon realized that there were a lot of great uses and ideas for both the fibers and the ribbon. I had a lot of Fabric Ribbons left over from when my mother used to put them in my hair - seems they matched my outfits. So, I have turned them into Scrapbook Ribbons and used them on the pages which have photos that I am actually wearing those ribbons. I also had a lot of fibers left over from my crochet and knitting days as well as embroidery and crewel work I occasionally worked with. Those are now Scrapbook Fibers. Think and look around - there are bound to be some that you already have. And don't forget, any ribbons from package wrapping for Holidays and Special Occasions can be turned into Scrapbook Ribbons. Ribbons and Scrapbook fibers can be used initially to pull through the hole in the end of a tag. Or maybe a very thin strip of paper cut to go through the hole in the tag. That's where I started. I resisted buying any scrapbooking fibers & ribbons at first as I had a lot of left over ribbons and yarns from sewing and knitting projects. 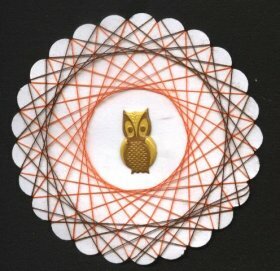 We also have another page devoted to Scrapbook Ribbons Embellishments. Then, I decided to actually put small ribbon pieces directly on the tag - as part of decorating the tag. These were tags I used for Journaling and the ribbon I used was small leftover pieces I had from some sewing projects. I was into magic mesh at that time also and it was a good way to try new things in small bits and pieces. "My mini art work." Then I progressed to using scrapbooking fibers & ribbons for some decorative bows; then to hang charms; then to hang title letter squares. I used some wider ribbon from a bow that I took apart and just had fun experimenting. Then I discovered that scrapbook fibers could be a lot more interesting than yarn from my knitting left overs and I started to branch out and purchased some and used them more and more on my layouts. 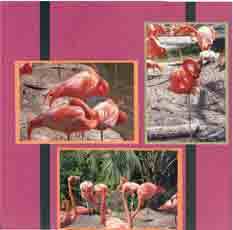 This ribbon below on the left page is not only frayed on the edges but changes color from the coral to the magenta - a perfect match for the paper colors. Then there is another small piece on the bottom left piece of card stock. This layout below has the same idea as above on left with the ribbon placement. 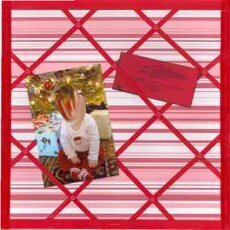 This time instead of placing the ribbon over a strip of patterned paper about 3 inches wide, a small photo is matted and placed over the ribbon strip. Ribbons of fabric or paper (1/4 inch to 1/2 inch paper strips) can also be used to cover the seams where you have pieced your background paper. 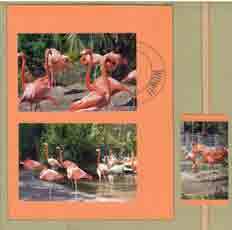 Or, in the left page below, just made to look like the background paper is pieced. 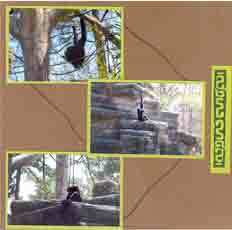 Scrapbook Fibers & Ribbons can be used to highlight or enhance a portion of your layout like the brown waxed linen or cording in the layout with the chimpanzees. They are swinging from vines in their little habitat and I just continued the visual onto the paper from the picture. Here's another enhancement using the brown waxed linen cording, but this time it is threaded through holes punched in the engineering drawing of a bridge. 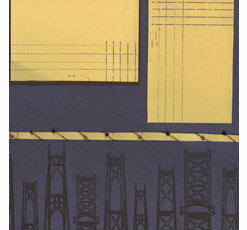 The paper and the linen cording were part of the Bridges kit from ClubScrap.com kit from February 2008. 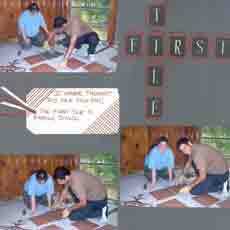 But you can do this tyoe of sewing with a lot of scrapbooking fibers & ribbons. We have more ideas for ribbons at our Tutorial for the Sew Easy Tool. These two layouts below without photos, were also from the ClubScrap.com monthly kit from February 2008 - Bridges. 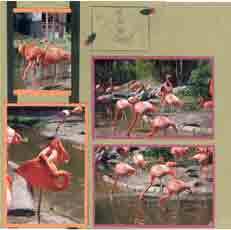 As part of the monthly membership with Club Scrap, you can download the instructions for Assembly Line Scrap Booking (ALSB) which tells you how to cut your papers and put together pre-made layouts using everything that comes in the monthly kit. A new concept, do your layout before you know what photos you are going to use. Personally, I love it as it gives me an opportunity to really enjoy the papers first and makes my scrapbooking really go fast. 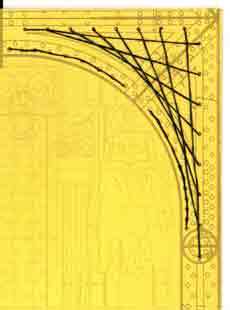 The layout on the left shows Scrapbook Fibers used again as lacing through holes in the scrapbook paper punched to replicate the lines in the engineering drawing. 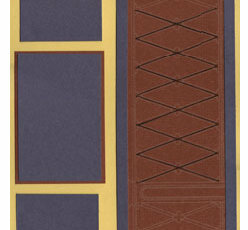 The layout on the right uses the same Scrapbook Fibers with small beads strung on the linen thread to wrap around the yellow paper ribbon used as an embellishment. This Spirella Design done with thread, is another embellishment that can be used to enhance your scrapbook layouts or cards. For more Thread Designs and a Spirella Tutorial, see our Spirella Designs page. 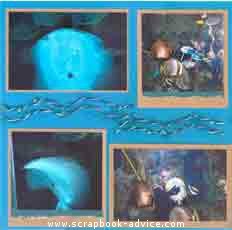 On the left, these blue and aqua fibers for scrapbooking also continue the image of the water from the photos of the stingray to the paper to tie the layout together. This fiber was attached in a wavy line with a very thin line of glue and allowed to dry before putting the layout into a page protector. 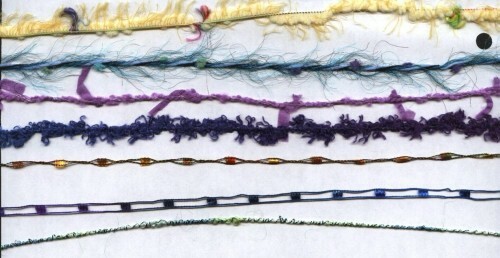 On the right, the blue and purple fibers for scrapbooking are used the accentuate the tags and tie the colors of the paper and photos together. Scrapbook Fibers & Scrapbook Ribbons come in solid colors, in styles with an edge that is different from the center of the ribbon, smooth, with ridges and patterned. These are just a few samples. Ribbons can also be used to create the entire image of your layout. 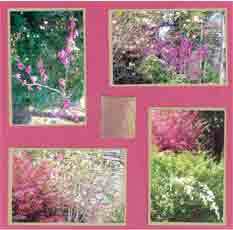 Check out these 2 layouts that are made to look like a French Notice Board. 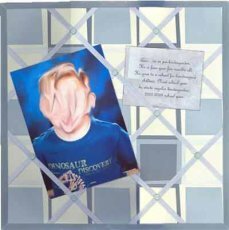 The photos of the two children have been blurred as I don't want to post children's photos on my website. Here is another example of using Ribbon to make a French Notice Board - this time it only takes up the border portion on the right side of the page. 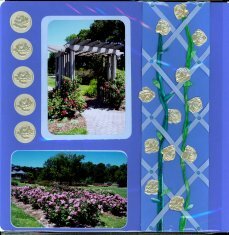 This scrapbook layout is about the Climbing Roses at the Norfolk Botanical Gardens in Norfolk, VA and using Ribbons attached at the intersections with blue brads, and "Twistel" or "Raffia" run through the ribbons to simulate vines. 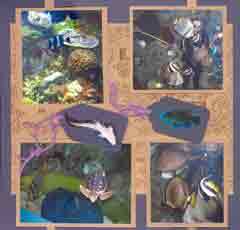 Just another great way to incorporate Scrapbook Fibers & Ribbons into your layouts. Hopefully these examples above will give you some good ideas to use fibers and ribbons on your scrapbook layouts in many different ways. 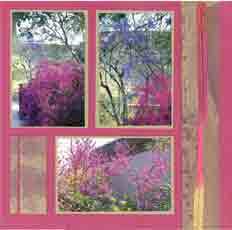 They add a lot of color, dimension and interest to your layouts and give you an opportunity to use up some scraps you may have had leftover from other projects. Below is our Ribbon & Fiber store. Hopefully you will be able to find what you are looking for to fit your needs. Use the scroll bar at the bottom of the box to scroll to the right and see other product categories, your Amazon Wish List; search for other products; or see product reviews. When you purchase from this page, you are actually purchasing from Amazon.com. All orders go through Amazon's secure order server.